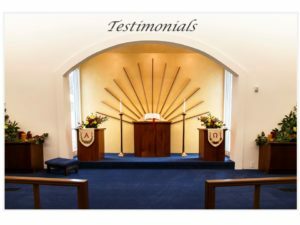 “We were introduced to the Washington New Church when our youngest son was about to go to middle school and we pulled him out of the public schools to attend the Church School. As we continued to learn more about the school it was only natural that we attend the church services. Having been raised in a Baptist church, we found the teachings of the New Church to align closely with many of the Baptist teachings. As our son continued to grow in the school, so did our involvement with the church. We love the small congregation and the ability to interact with both the pastor and assistant pastor. Spiritual support was always there when needed.” ~ C. Moore and Family, Glendale, MD. “My family has moved around quite a bit over the years but nearly 30 years ago we settled down in the Washington Metro area and made a more permanent home here. Upon arriving in the area I was immediately able to become involved in the uses of both the church and the school – having all of my children attend the affiliated school.